•	Ideal for seasoned runners who have been consistently running 5 or 6 days a week for a minimum of 1 year. These runners should also have completed a minimum of seven 5KM road races and should regularly incorporate speed work into their training. This plan is designed for runners seeking significant PRs in the 5KM distance and who are transitioning to the 10KM and half marathon. 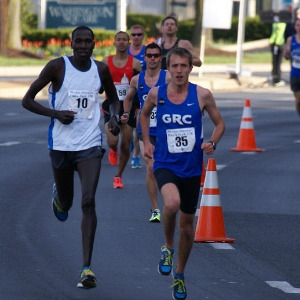 A competitive runner himself, Wilson Komen brings nearly a decade of experience to his coaching. He sees it as his mission to help all of his runners—new and experienced alike—maintain healthy, consistent training regimens that will lead to rewarding racing experiences. Coach Wilson Komen is certified by the Road Runners Club of America.